KIRCHBERG, Luxembourg — There were only smiling faces to be seen at Radio Télévision Luxembourg (RTL)when on July 28, Studer’s new Vista 9 digital console was used for the first time in the live production of the 7 o’clock news. Only three days earlier, the former console had been removed and connections routed to a spare desk. At that moment, the engineering team from specialist installation company, BCE, zipped into action. BCE carried out a well-prepared operation to reconnect everything and network to the video embedders/de-embedders, the new digital lines and the monitoring in several rooms. At the same time, Studer support engineer Rudolf Boltshauser was carrying out the programming and testing of the console, the labeling and the I/O. RTL chose the Vista 9 largely because of the projected total cost of ownership, but also because of its positive experience with the Vista 8. Another major factor in RTL’s decision was the Studer RELINK feature, which allows easy resource sharing between the fixed Vista 9 and the remote Vista 8. The Vista 9 will be used principally for prime-time live productions in the adjacent studios. 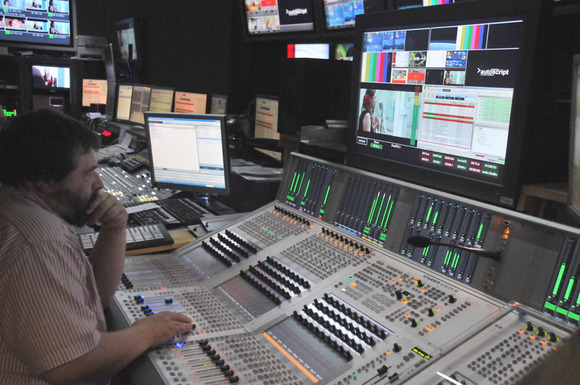 The console will be the beating heart for all popular live news, election shows and sports coverage, while its main application will be for the daily news and weather show. Building on the successful Vista digital mixing platform, the Vista 9 combines advanced ergonomic design with complete system flexibility and pristine audio quality, at the same time taking theoperator experience to a higher level, supplementing the Vistonics™ interface with radical and innovative TFT-based metering, FaderGlow™ and numerous other innovations. In a next development phase, a MADI connection will be set up between the new Vista 9 and Vista 8, that has been in use for the past six years in the OB van.